Edited by Nephretes at 21:33, 14 Dec 2015. Alternative units are going to be independent release. We feel that it is consistent with the mod organizations under VCMI launcher which won't force you to play mods you don't happen to like. With this said I must point out that MDT towns are going to have their own alternatives as well. It is yet to be determined if it will be in a form of submod for alternatives (requiring town to work) or will be connected inseparably with a town, and eventually require alternatives as well. 3rd upgrades mod autor is outside of MDT team. I highly doubt those mods will be compatible as they edit the same thing: units. If we ever consider those mods working together we would have to make 3rd upgrades for alternatives as well, which as far as I know, are not planned. Alternatives alone are very hard to balance, with another mod it may become impossible in my opinion. As an Oasis leader I must say that I prefer alternatives more so for this town you won't get to see 3rd upgrades. Along with alternative units we have devided to improve some of the original units for example we have improved elf from bastion. Do your team plan to fully replace copyrighted 3do graphics for units by remade models? Edited by Nephretes at 20:48, 02 Jan 2016. Can you please pay attention to key-word up in here? "Some", therefore not all of them. Where can I download the MDT mod? Edited by Nephretes at 20:41, 04 Jan 2016. Perhaps halfling is one of the earliest NWC unit. We are making this assumption based on his model, and also very limited (in terms of frame number) animations. here can I download the MDT mod? Edited by Dj at 23:32, 05 Jan 2016. I agree that making 3rd upgrades to alternative units would take a lot time and personally i preffer alternatives over 3rd upgrades but those guys are talented too! I mean their work is genius and id hate to choose between these 2 great mods. About the hobbit, awesome work as usual! What about bone/ghost dragons? 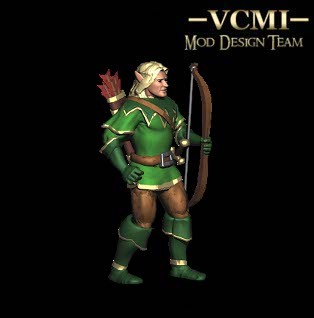 Out of all homm3 units those look the worst. You cant even distinguish the lines. Do you plan on replacing them too? What about genies/master genies? The degrade is a female and the upgrade is a male (the only case of different genders in homm3). Are you going to do anything about that? Also, since VCMI is more flexible and you can do anything with this engine are you going to implement the "lost" casting animations of unicorns, harpies, vampires etc? Edited by Nephretes at 22:46, 11 Jan 2016. What is one of the most classical fantasy creatures which exist in game, but not in a form of an unit? i look forward to the siren's release. it's very nice. Edited by Nephretes at 00:35, 12 Jan 2016. Should I render naked version for you as well so promised earlier dryad won't be the only liberated woman? Looks awesome as usual. Will she have some special ability? I hate H6 with all my guts but sirens there had a nice touch: creatures couldn't attack her when adjacent, charmed by her chant. IIRC you could run and hit, but once too close, not possible anymore. i was hoping you'd ask. and yes, please. i would make it worth your while. Werent "Sirens" the other water object/creatures where you lost 30 percent (i guess) of your troops in Exchange of experience ? They look like some sea hag/harpy. Doesnt make the unit any less awesome. I might be wrong with the siren thing tho. It's been a while since last update... I hope you didn't abandoned the project. Maybe it's not my place to judge or anything, but I would suggest you'd focus on adding small features at first instead of chaotically try to reinvent the whole game. For instance, elves animations is pretty good as it is, I don't think it would make a lot of difference If you spent your time on making it any better. Wouldn't that energy and creativity be best spend on adding new things that are not already there? Again, this is just my opinion, I just would like to see some of your work done, because I think it is well made and I would like to try it out myself someday. Dont worry this project will not be lost, they finished it. You see that units projects are in NWC graphic level. Alternatives in units is the best thing which can be done. Its like adding Heroes IV to HIII. Road is good but there is a lot of work. damn, i had forgotten about this project(it's been so long). keep up the good work. i'm really looking forward to the release. Project isn't dead. Just team decided not to share every picure they make, so we must be patient. I was wondering what happened to this and Oasis. Nephretes might come up and clarify.